Over the past decade, the Centers for Medicare & Medicaid Services (CMS) has steadily ramped up penalties for high readmission rates. "Reducing unnecessary readmissions is a key priority for hospital partners and many now make their referral decisions based on rates of readmission," write the authors of a new white paper from Frost & Sullivan exploring how post-acute facilities can improve their competitive advantage. Readmissions have "a significant financial impact" on post-acute and skilled nursing facilities, they add, and so "need to be aggressively managed" to ensure sustainability. The authors go on to reveal a potentially powerful solution in the form of contact-free continuous monitoring (CFCM), a technology that’s been proven to reduce hospital readmissions rates in an era where doing so has taken on new importance. 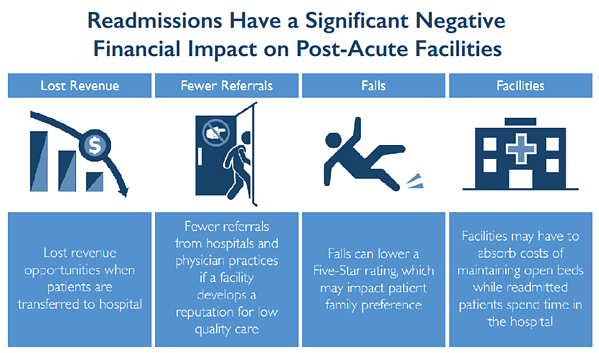 Preventing patient falls, "one of the most common reasons post-acute patients are readmitted to the hospital"
The authors point to a 2013 study evaluating the use of CFCM in a post-acute facility that showed a 19% reduction in hospital readmissions. "A separate study demonstrated CFCM’s ability to reduce pressure ulcers by 64%," they add. Other facilities that the researchers interviewed anecdotally "reported readmission rates declining at approximately 30% after installation of their CFCM systems thanks to both fall prevention and the ability to pick up earlier on patient deterioration." With all these benefits combined, and "based on the best available literature," the researchers estimate that the implementation of contact-free continuous monitoring could help a typical post-acute facility reduce readmissions by 20%, "helping the facility retain reimbursement that it would have lost otherwise." CFCM is an effective tool, then, for letting post-acute managers avoid the kind of repeat rehospitalizations that can jeopardize future referrals. In addition, it’s also a great tool for generating new referrals from new sources, thanks to its ability to let facilities admit more medically complex patients (who bill at a 63% higher rate, and have a 75% longer length of stay). The benefits of reduced hospital readmissions are no less applicable for skilled nursing facilities, which are similarly faced with an increasingly competitive market and razor-thin margins. And, with its skilled nursing facility value-based purchasing (SNFVBP) program, the CMS will start basing reimbursement rates for SNFs partially on their readmission rates on October 1, 2018. CMS penalties aren’t the only negative effects of readmissions: "Many facilities, whether out of courtesy or legal obligation, may keep a patient’s bed open in the post-acute facility in the event that patient is transferred back to the hospital, particularly for private pay, Medicaid and dual-eligible patients," the authors write. "Consequently, SNFs forego anticipated revenue from these patients when they are readmitted. Facilities using CFCM can expect to reduce their rehospitalization rates and thereby reduce the number of these empty and unusable beds that they may have," they add. "Our leading reason for readmissions was low blood sugar, and next falls and UTIs," reported Marsha Moor, former Coordinator of a 150-bed SNF that deployed CFCM in its 28-bed complex acuity unit in 2016. "After putting CFCM in place, we saw a 31% reduction in readmissions." She continues: "In the first 30 days after [CFCM installation] we saw a 50% reduction in falls, and we saw improvement beyond that at 60 and 90 days." She also reported that the system helped managers correct gaps in clinical documentation and "provided nurses with more time to document supporting evidence for more accurate payment reporting, which had a positive effect on their revenue cycle." Whether you manage a post-acute center or a skilled nursing facility, contact-free continuous monitoring can help you achieve a lower rate of hospital readmissions.